The boys basketball tripleheader scheduled for 1/12 that was cancelled has been rescheduled for Saturday, 2/3 with the frosh playing at 4:30 followed by jv at 6 and varsity at 7:15 pm. The SWC Cheerleading Championships will be held on Monday, November 6th at Midview HS starting at 6 pm as all 10 SWC Schools will compete for the Cheer Championship! Tickets are all $6 and the event will most likely be sold out! Get your tickets early in the athletic office! 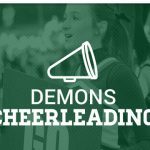 Go Demons!